Ashtanga Yoga is being priced out of their studio on Broome Street, said business owner Eddie Stern. SOHO — A yoga studio "blessed" by the creator of Ashtanga yoga is leaving its longtime home on Broome Street at the end of August, according to the studio's owner. Ashtanga Yoga New York was "blessed" by Sri K. Pattabhi Jois, the Indian creator of Ashtanga yoga, when it opened at 430 Broome St. in 1995, said owner Eddie Stern. Stern and his wife, Jocylene, say they learned the practice directly from Pattabhi Jois in India in 1991, and their business is considered the New York City branch of the teacher's India-based school. Stern said he had "known for some time" that he would have to vacate his space, but was supposed to have until the end of September. 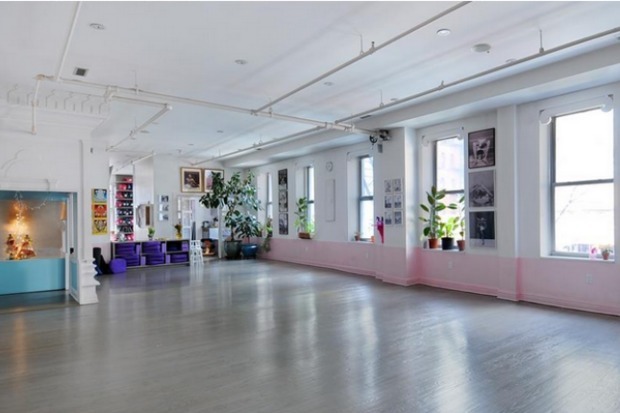 Though the space is being listed by Corcoran as a $4.2 million condo, Stern said he's been told the landlord decided to rent it to another yoga school. "I don’t know how we all feel about that," Stern said. "I think it’s weird, but that’s how it goes." Their space also held a Hindu temple that Pattabhi Jois consecrated in 2001. Stern added that he has always had a good relationship with his landlord, and that "the entire experience has been nothing but friendly and cordial." Stern did not identify his landlords, but building records for the space were signed by Nathan Kornfeld, at the address listed on the Crosby Street Partners website. "The guy who bought the place was a very nice person," he said. "[And] our old landlords were very nice people." Stern said his rent spiked from $6,500 to $12,500 last September, and for the past year and a half, he's been paying $15,000 per month. "New York City — and in particular SoHo — real estate prices have driven us out of the area," Stern said. The new yoga studio replacing his will be paying "considerably more" than that, he said. He declined to provide a number. "I don't think it's up to me to disclose that amount," he said. Kornfeld did not immediately respond to a request for comment. Stern said he did not know the name or owner of the new yoga studio. A residential broker for the space, who is trying to sell it rather than rent it, said she was unaware of a new tenant. A commercial broker said he was "not at liberty to discuss" anything about the space. It was being co-brokered by both a residential and a commercial broker because it is a live-work premise. Stern said he feels "OK" about the situation. "We’ll find something else in Manhattan which is more affordable," he said. "SoHo is not quite what it used to be — sort of like living in a mall. I think this will be a good change for us." Stern said they are committed to finding a new "small place" downtown, though not in SoHo. They are also in the process of renovating a Brooklyn location, which they plan to open in September or October.